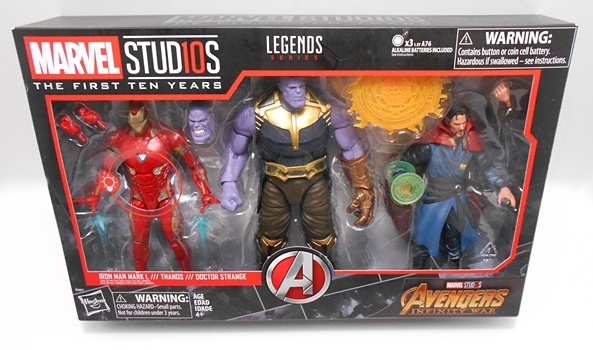 In case you’re just joining us, Hasbro has been celebrating the First Ten Years of the Marvel Cinematic Universe by releasing some MCU-based Legends figures that they didn’t get to the first time around. These have run the gamut from single figures to two-packs and three-packs. 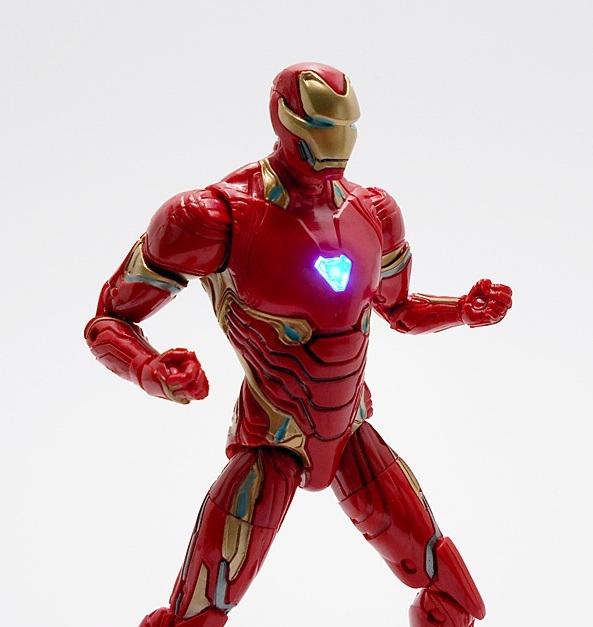 Today’s set is arguably the least essential of them all, since the Thanos Wave not only let us build an MCU Thanos, but it also gave us the Mark L Iron Man armor. 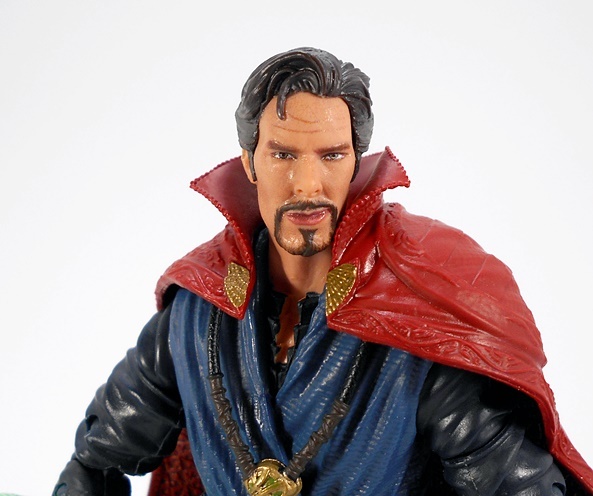 Plus, Doctor Strange’s look hasn’t changed much since the MCU version was released in the Dormammu Wave. Nonetheless, there are some tweaks and bobs here to offer something new. 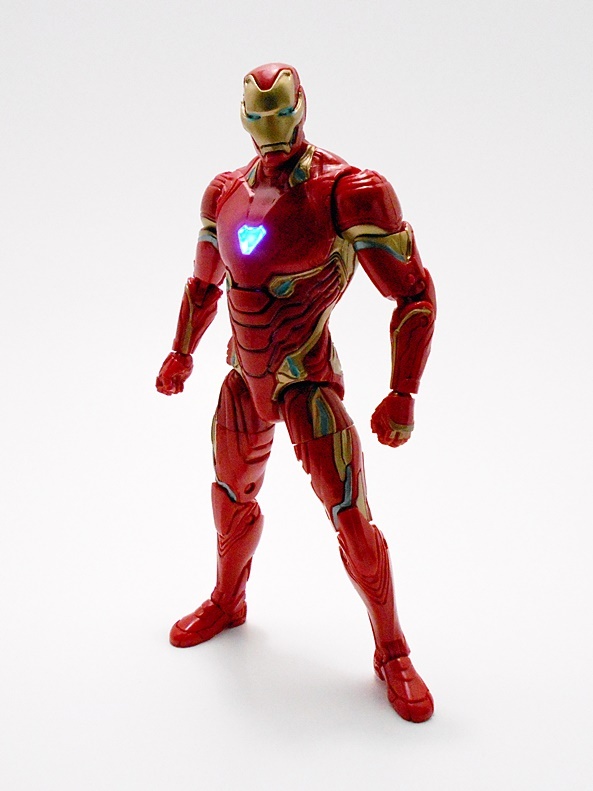 So, let’s dive in and see if this set can really justify its existence, and we’ll start with Iron Man! The Mark L armor was really cool in the film because of the things it could do, but the overall design didn’t really impress me. It’s not a bad looking suit, but there’s nothing all that distinctive about it to me either. 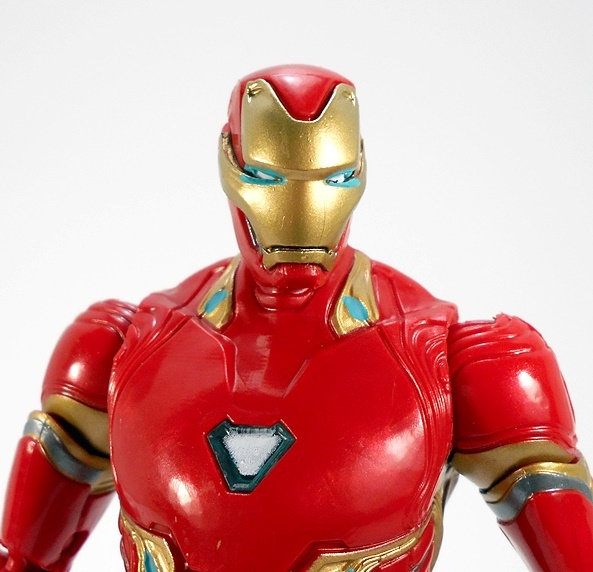 This model is a bit more rounded and organic looking, which reminds me of the Mark II/III, but it does feature an interesting shape to the Arc Reactor, some cool panel lines, and some interesting placement of the gold trim. 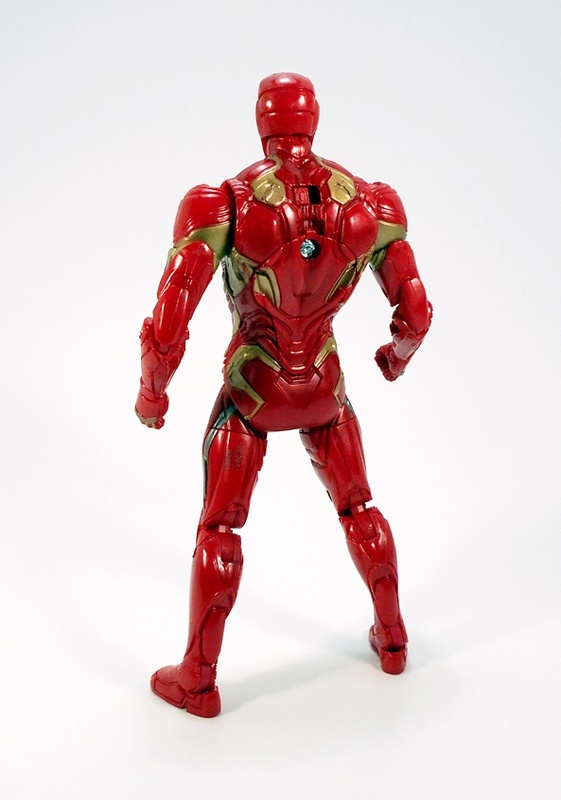 The red finish is also nice and glossy and replicates that new car finish that I like to see in my Iron Man armors. You also get some light blue paint apps to simulate energy glow and the effects of these are hit-and-miss. I think they look OK on most of the figure until you get in close and then they can look rather sloppy. That’s especially the case around the eyes. The back of the figure features a rather unsightly screw to the battery compartment and an on/off switch to take the electronics out of test mode. Yes, if the Try Me window on the box didn’t give it away, this baby has a light up feature! The light up feature only includes the Arc Reactor, but it is damn bright. I didn’t even have to dim my studio lights that much to make it show up in the pictures. It’s activated by a button just below the chest and I dig how it slowly activates, rather than just flicking on and off. I didn’t light it up for all the pictures, but it should be obvious in the pictures where it is ignited. When I bought this set online, I actually did not realize the light up feature was even there, so it was a cool surprise. Of course, where there’s cool lights, there’s also a trade-off with articulation. 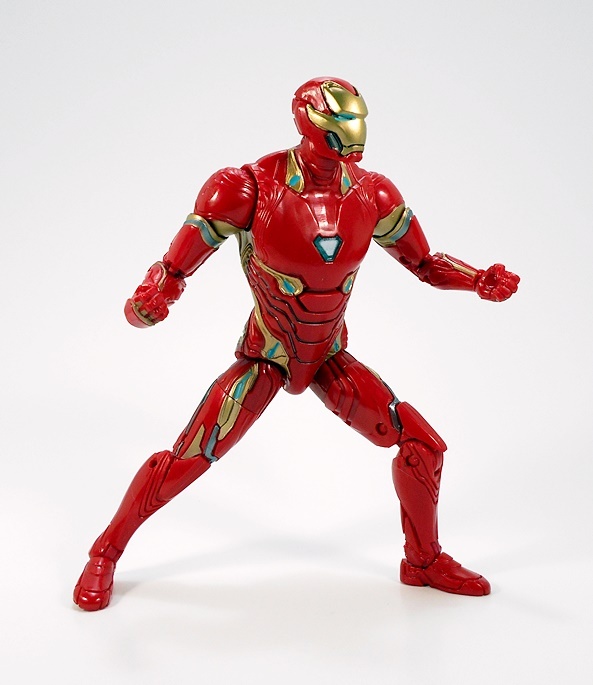 This Mark L has absolutely no articulation in the torso, which is certainly limiting. All the usual points are present in the limbs. That includes rotating hinges in the shoulders, double hinges in the elbows and knees, hinges in the ankles, and swivels in the biceps and thighs. The neck is also ball jointed. 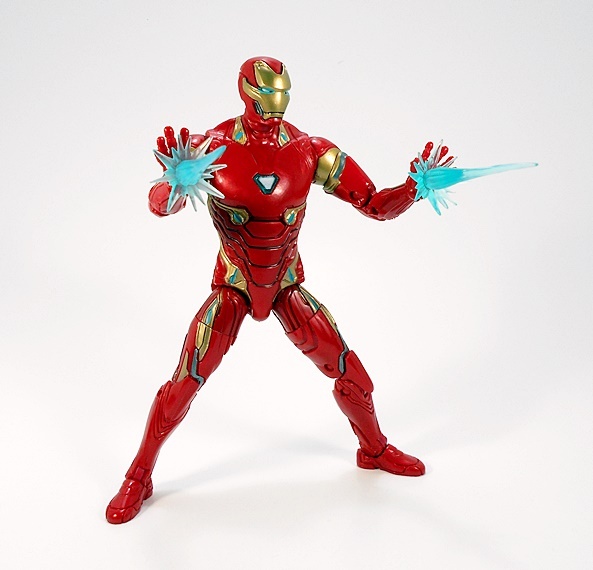 The wrist articulation depends on which set of hands you have in place. One set is open hands and they are have no hinges, but will swivel on the pegs. 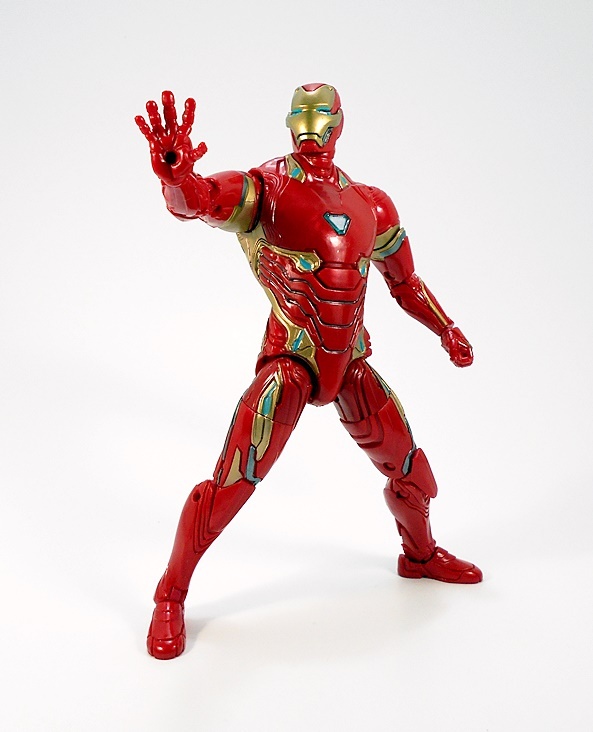 I’m actually OK with that, because previous MCU Armors haven’t been able to get the open hands in full-on Stop! position because of sculpting in the sleeves. I’m happy this one can. And the swap-out fists do have hinges. 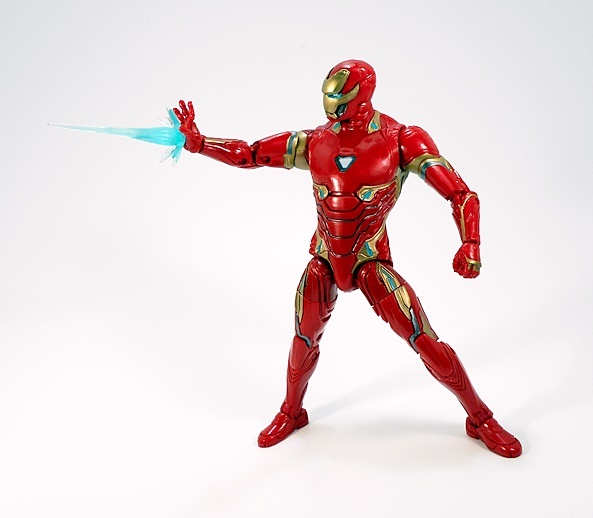 You also get a pair of repulsor blast effect parts. 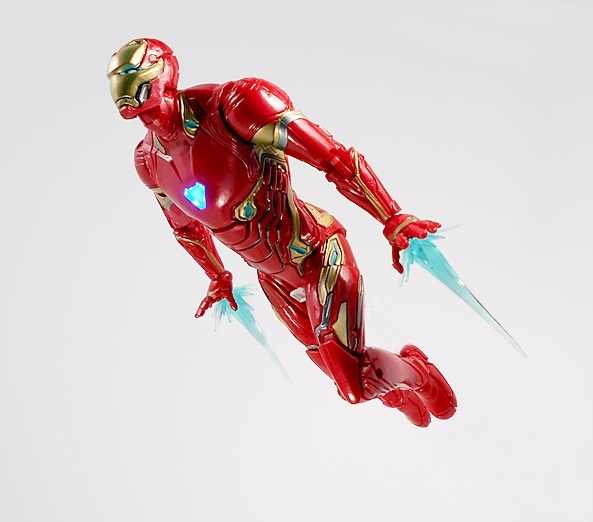 These peg into the holes in the open hand palms or the bottoms of the feet and they are indeed the same pieces that came with Invincible Iron Man from the Okoye Wave! Overall, I like this figure a lot and the novelty of the light up Reactor outweighs the hit in torso articulation. 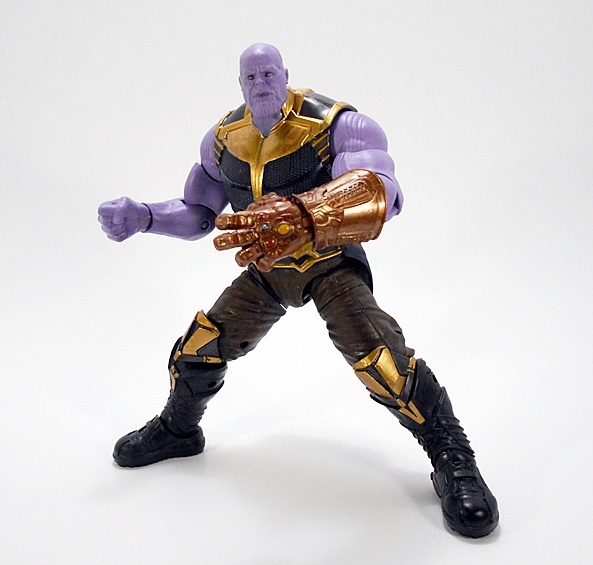 Plus, it’s nice to know that if I want that articulation, I could always pick up the Mark L that was part of the Thanos Wave, which has been turning up pretty cheap here and there. Let’s check out Doctor Strange next! 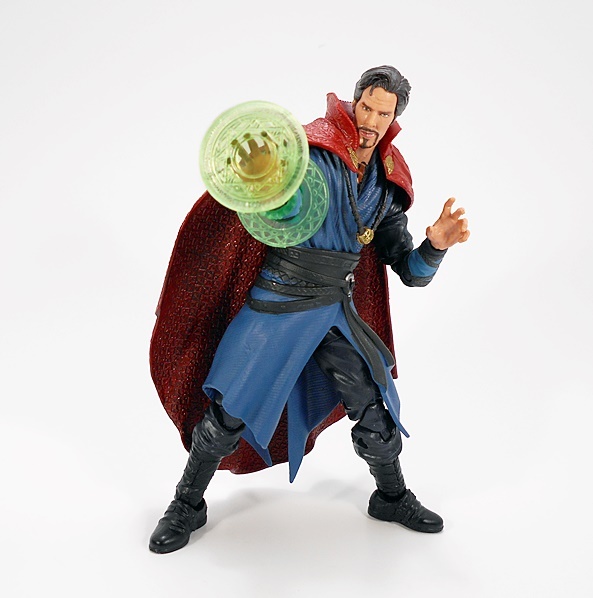 I’m not going to spend a huge amount of time with Doctor Strange, because he’s about 90% of the same sculpt as the one from the Dormammu Wave. 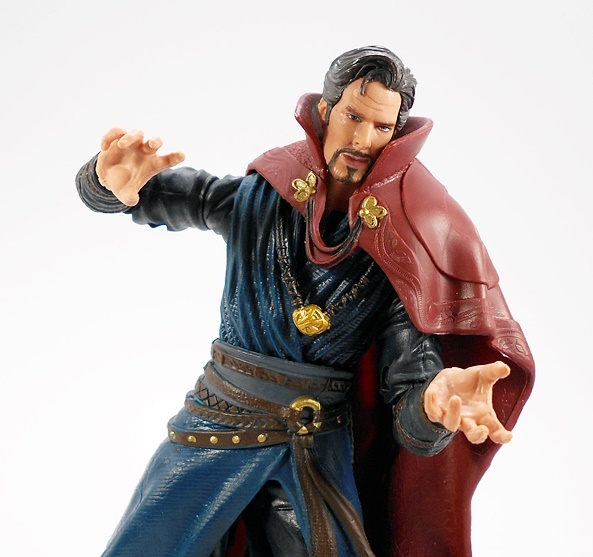 In fact, from the neck down the only new sculpting involves his lower left arm, which now has permanently attached magic effect parts, and the Cloak of Levitation, which is an all new piece. 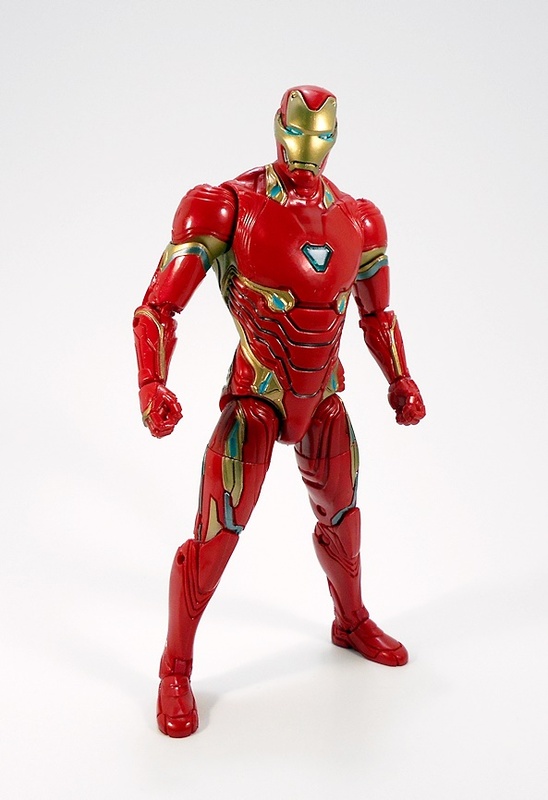 This was a solid figure back then and it still is, but unfortunately the new paint on the costume isn’t all that great. The tunic is a lot brighter, and I don’t think it looks as good as the previous release. Also, Hasbro cheaped out on painting the belts. Previously they were painted brown with some gold paint apps on the fixtures, now they’re just left black with just some silver paint on the ring. The gold paint used for the Eye of Agamatto is also brighter and better looking on the older figure. 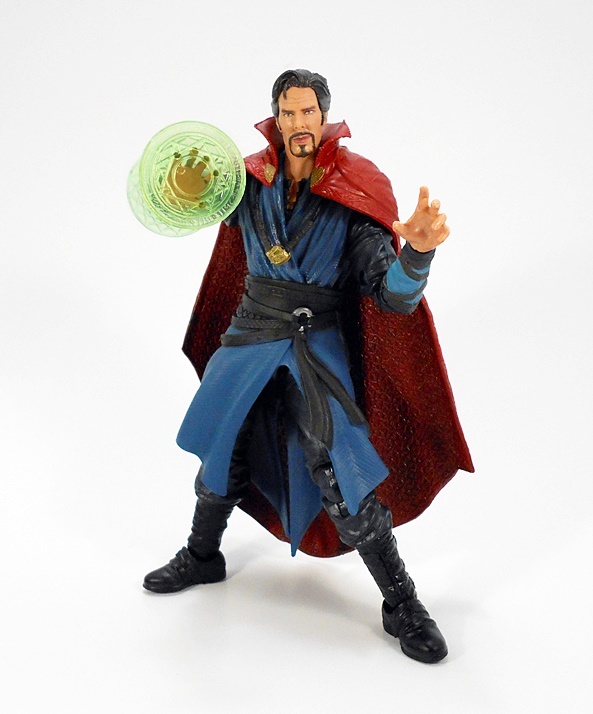 The permanent effect parts are probably going to irk collectors who are looking to pick this one up as their only MCU Strange, but since it’s my second Legends Strange I’m OK with them. 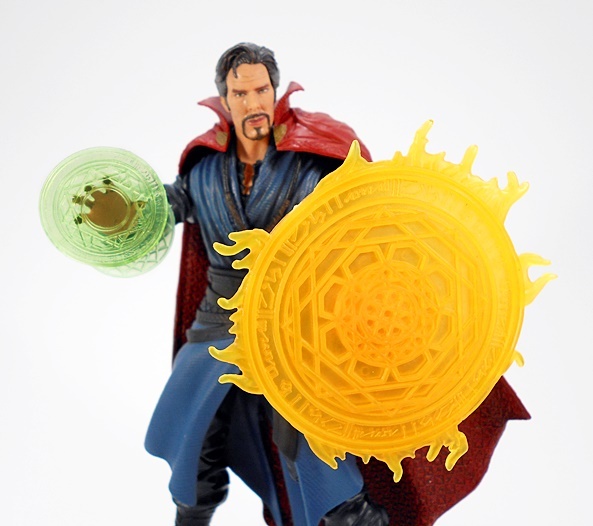 The magic discs are cast in translucent green plastic and they look pretty cool, but I think the way to go here would have been to give him a swap-out arm so they aren’t always there. The new Cloak, on the other hand, is a big improvement over the one from the previous figure. This one pegs into the back of the figure, features a sharper sculpt, brighter colors, and it’s all around less cumberbatchsome. See what I did there? 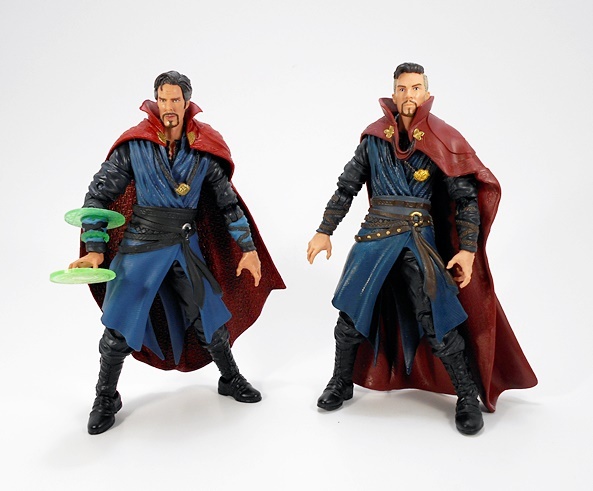 You can indeed swap out heads and put this new one on the older figure, making what I think is very nearly the ultimate Legends MCU Strange. The only downside here is that the new Cloak can’t easily be put onto the older figure, as it doesn’t have a peg hole on the back. That’s a shame, because besides the head sculpt, the Cloak is the only thing I like more on the new figure. 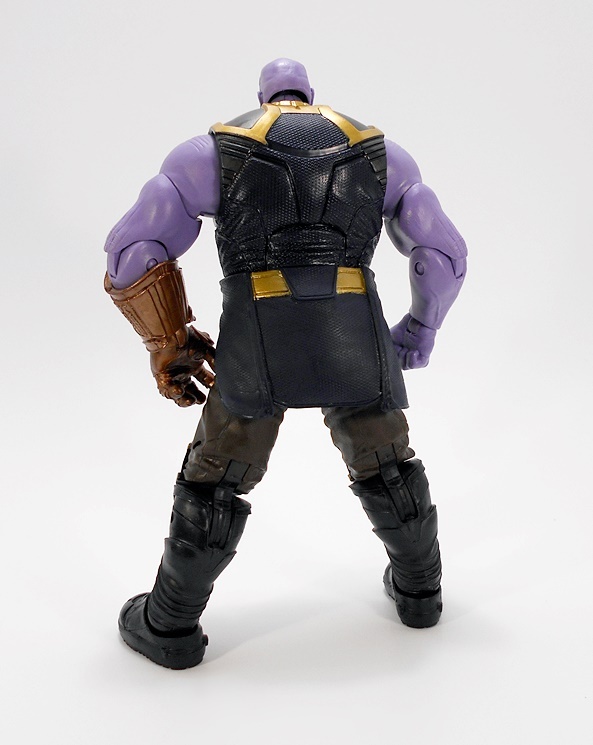 The sculpt is sharper, I like the brighter color, the clasps reflect the Infinity War change, and because it pegs into the back, it kind of looks like it’s levitating over his shoulders, which is cool. But with that having been said, I still think the new head on the previous release is the way to go. 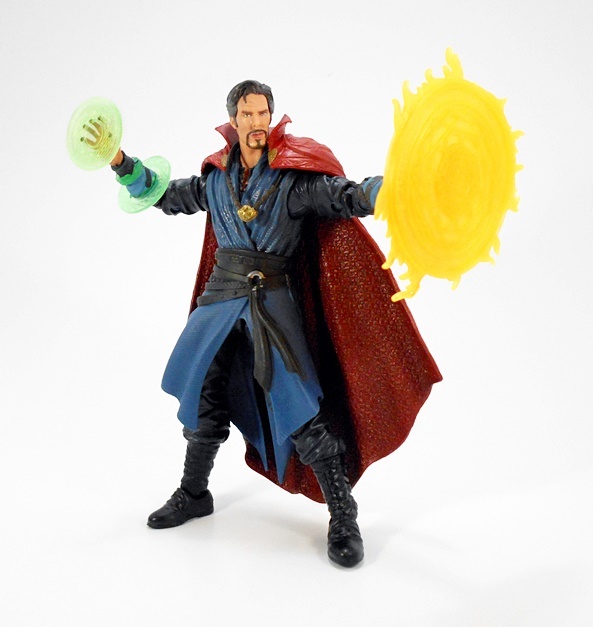 Strange’s accessories include a swap out left hand that’s designed to hold the big yellow magic wheel that came with the last Strange figure. These are fine, but we’ve seen them before and I’ve got nothing else to say about them. As it is, this figure adds some nice new display possibilities, but it’s a real mixed bag, with some steps forward and some steps back. I do think that if they were going to make the magic effect parts permanent, they should have rigged them to light up, but now we’re probably adding more cost onto what i already a pretty pricey set. 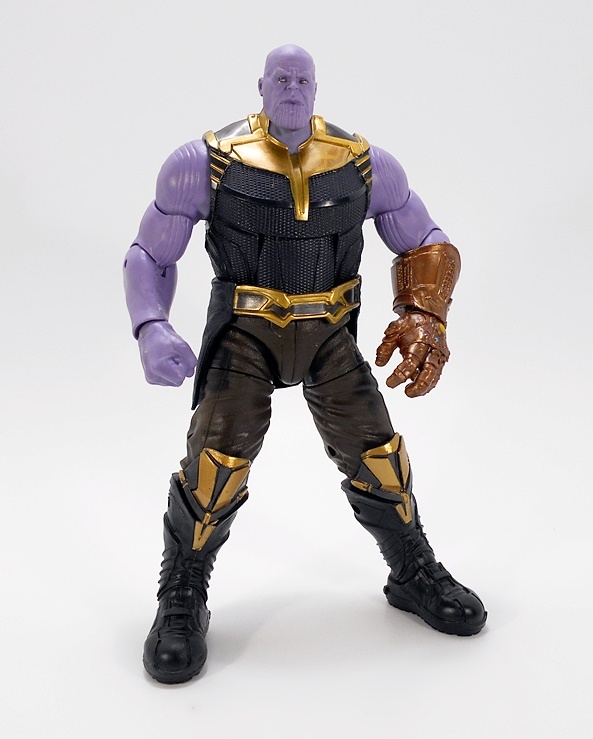 Let’s move on to the final figure in the box, Thanos! 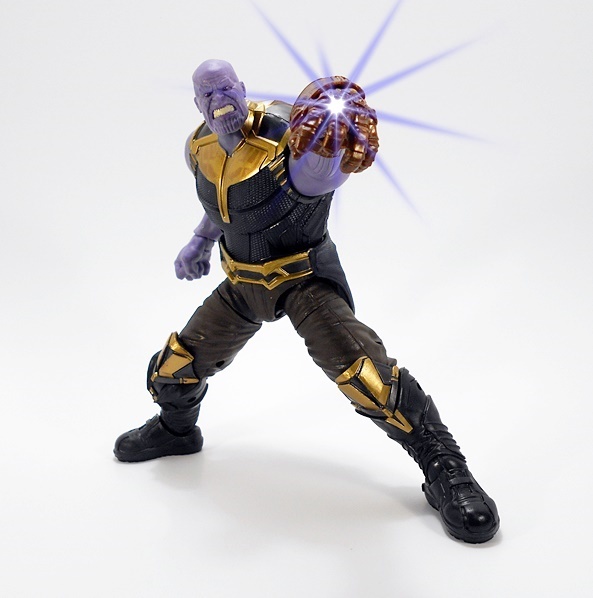 Thanos is probably the most puzzling figure in this box, since it hits at a time when the Thanos Wave is still populating the pegs, and a lot of collectors are cobbling together the Thanos Build-A-Figure. 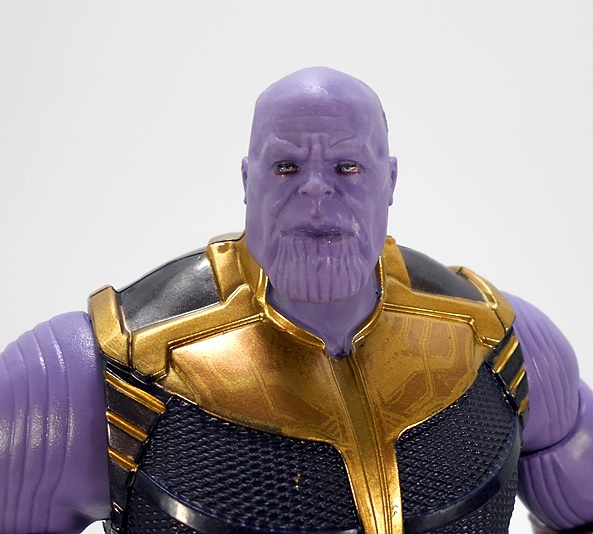 This Thanos, however, was a big draw for me since I still haven’t found the Infinity War Captain America at a good price, and so I’d still be missing the head for my Thanos BAF. That means that I’ll have two bodies and two heads to display on them. Pretty cool. It also means, that I’ll probably just pick up Cap loose on Ebay without the BAF part and save a few bucks. 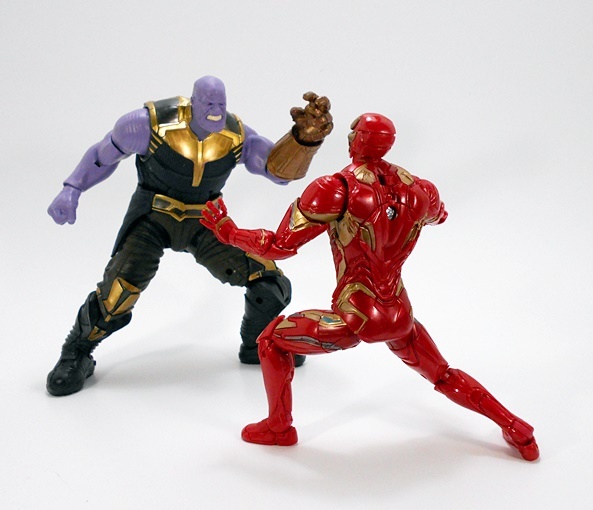 And since I don’t have the Thanos BAF built yet, I can’t really compare the two figures. Still, from what I’ve seen the sculpt looks identical, at least from the neck down, and the only difference should be in paint variances. 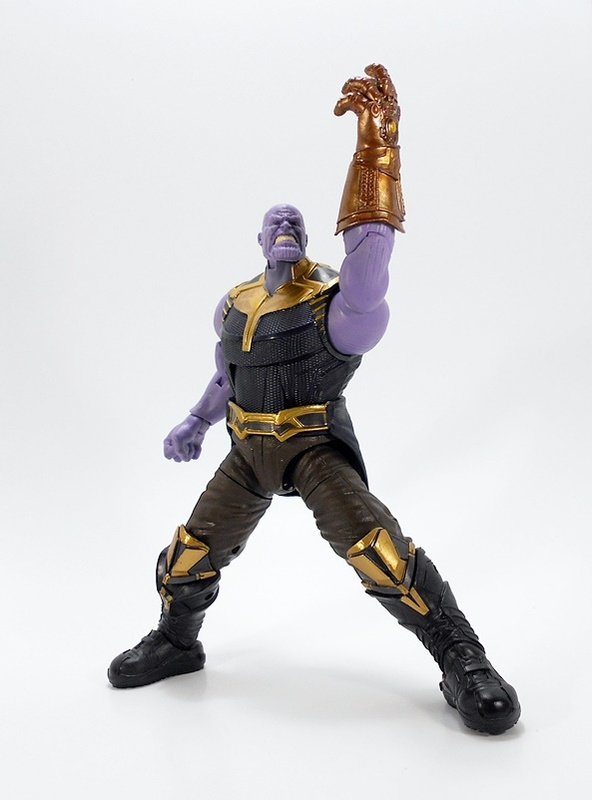 It’s a great looking figure, even though I wasn’t a huge fan of Thanos’ costume in the film. It’s not bad, it’s just a lot more pedestrian looking than his full-on armor. 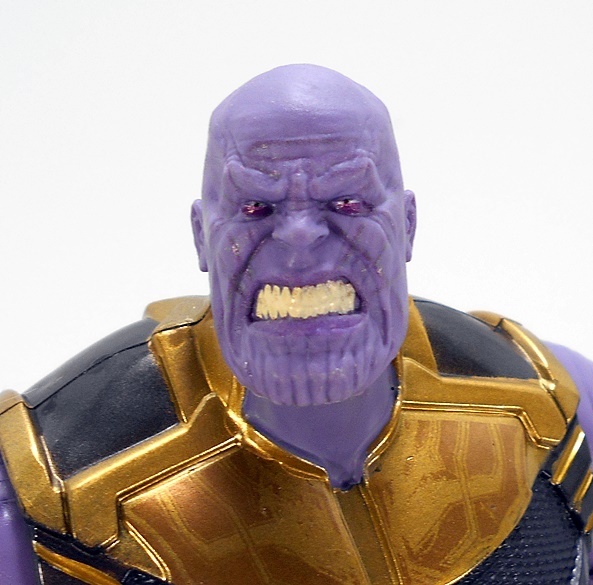 I get, why they needed to go for something more practical, though, and my lack of enthusiasm for the Infinity War costume wound up saving me money on a Hot Toys figure. Still, I’m happy to have him in Legends scale. The two heads are pretty good. You get one sort of neutral expression and one with him grimacing (no pun intended) in rage. The former features a rather serene expression and I think he possibly even looks a bit stoned. 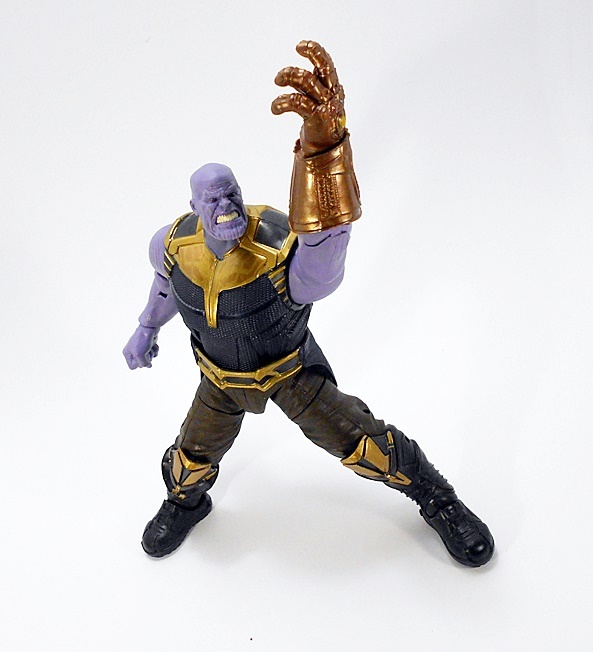 The second one is my favorite of the pair, and it’s probably the one I’ll be displaying on the figure, at least until I build the other Thanos body. 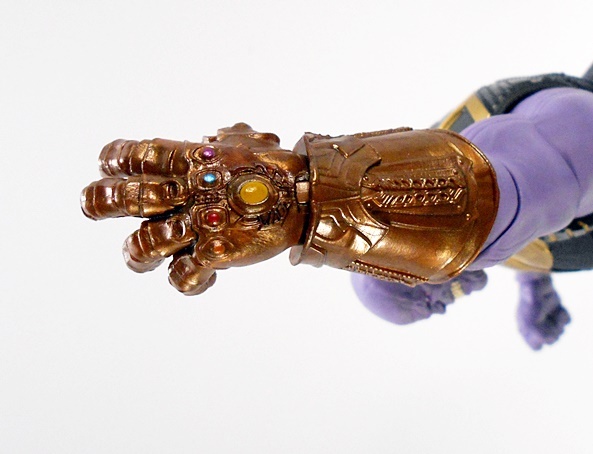 They did a beautiful job sculpting the Infinity Gauntlet and the quality of gold paint is excellent, as it is on the rest of the figure. 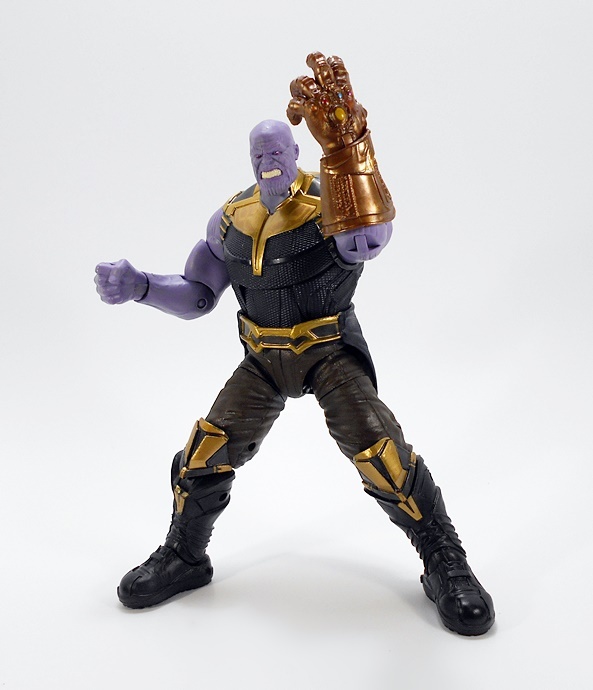 The obvious missed opportunity here would have been to include a swap-out fist for the Gauntlet, but I think that would have probably cost more than the extra head-sculpt. There’s definitely an argument to be had for this being the least essential of all Marvel Studios First Ten Years releases. 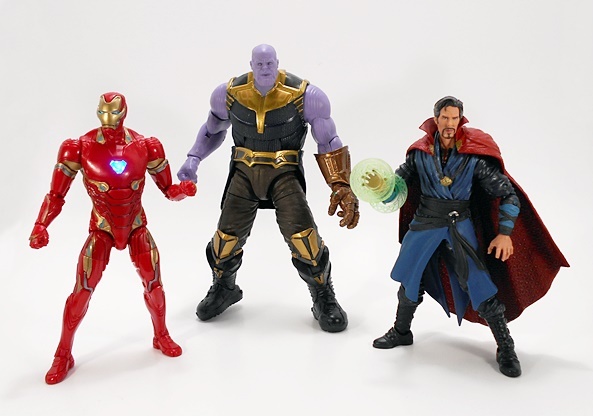 If you’ve been collecting all the waves of Marvel Legends, you’re already set with all of these characters. And with an original retail of $70, it can be a hard pill to swallow for just wanting to be a completist. That’s especially the case when you factor in how prolific Legends has been and how collecting the non-stop releases can take a toll on your wallet. That’s not to say there isn’t some cool stuff in here. I’m surprised at how much I dig the light up feature on the Mark L Armor, and the new Cumberbatch likeness on Doctor Strange was also a welcome addition. It also helps that I picked up this set off a Cyber Monday deal, which dropped it down to about $38, making it only about $13 a figure. Not bad, but it would have been an easy pass for me at full price.